Update Sep 18, 2017: Here is the latest revision of the PCB included in the kit. Update Oct 8, 2015: The latest revision of the PCB (pictured here and here) has hardware support for XBee (which also covers GPSBee, WiFiBee and BTBee). With this kit you build a clock like the ones shown in the photos below. Last one, courtesy of Nick, features an yellow/amber display. Schematic and board layout are shown below. The board supports other types of displays as well, through the use of adapters. So far, beside the HDSP-2534 coming with the kit, there are adapters for HDSP-231x and QDSP-6064 (the sketch is different for this one), shown below. Finding the right place for the components on the board should be straightforward, since the silkscreen shows their values and their orientation. solder the machined pins, on the side facing the main board (the bottom row is just underneath the main PCB, the top row is above the main PCB). In the end, it should look like in the photo below. Then insert the display with the key (the "cut" corner) in the left bottom of the adapter. An assembly video can be also found in this post..
As of Oct. 8, 2015, an HCMS-29xx adapter is available (shared on oshpark), for use with the "serial" intelligent displays (as opposed to the "parallel" HDSP-2534 coming in the kit). Why is it called WiFiChron? Does it use WiFi? I'm glad to see the 3231 replacing the 1307! I'd love to see your eagle files for the display adapter, I have tons of those 2534s myself. I just saw your comment (I did not get a notification). Yes, called WiFiChron because has WiFi support. Thanks for posting those files. I like the idea of the display adapter. I have a question about the HDSP displays. 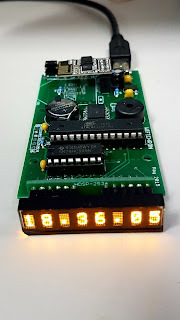 I built a similar clock, using a Atmega328P, DS3231, and HDSP-2534 display. Everything works ok, but the display "brightens" up over a few seconds. It seems like all the pixels get brighter and the contrast decreases. Then it will go back to normal and slowly brighten up again. Have you seen anything like this? I'm wondering if I have too much noise in my board, or the signal ground and Voltage ground aren't separate enough. I''ll try to put some more capacitors around tomorrow, but I thought I'd ask if you've seen this. As you know, display brightness on HDSP-2534 is controlled through commands. You should check your code, it may be just a bug. I doubt it that "too much noise" is the cause. Remember that these displays are used in medical equipment, avionics, military. They must work reliably in (sometimes) tough conditions. Please let me know how you fixed this, I'm interested. I reduced the brightness to 13% and it looks great. I think at 100% it may have been a power issue. I see in the data sheet that 8 "#" signs could use up to 480mA. So maybe some more capacitance would help if I wanted to run full brightness. My current board works good up to 53% brightness. I put a picture up on my flickr if you want to see it. It's designed to go in a 'sick of beige' acrylic case, and be powered off a mini-usb. Thanks for the clarification, now I see what you mean. I checked the same on mine(s) and they all work ok at the highest brightness. Maybe your 5V power source is not very clean, as you said. Filtering capacitors may work indeed. Did you try powering directly from computer's USB (supposed to give a clean 5V)? Hi, I was looking to modify the sketch for this project to work with a different display, in fact 8 Siemens DLG4137. I have already written a sketch that will drive the displays which works and I know how to work it into your code to drive these different display. However I don't have a 8Mhz ATMEGA328 to test it on, I wanted to test it on a Nano as that is all I have to hand at the moment, but these are all 16Mhz. I was able to compile and upload the code to the Nano but could not get it to run, in Debug mode it prints "In setup" then scrolls nonsense as if the wrong baud rate is set, would this be related to the clock freq of the MCU to you think? In fact it does the same with the unmodified sketch for the HDSP display. The sketch should work similarly for 8MHz or 16MHz. What I think happens in your case is "out of RAM". Try to cut/comment out some functionality. Both the HDSP and the WiFiChron use the RAM (and prog memory) to the max. Thanks for the reply, I thought that was a possibility, I changed a few INTs to uint8_t where I could to save a little space, it says there is now 512 bytes for local variables now, which is not much, If I compile your original sketch without any modifications there is only 464 bytes available. Should be also noted that the PCB shown in the photo of the kit has actually been through a few revisions now. The latest has support for XBee-like devices. You should really try using an ATmega1284; no more code limitations (relatively speaking). i have about 8-10 of the HDSP-2531 displays. i was trying to message you directly somehow about seeing if i could enlist your help or advice with a clock project i want to build. i can't figure out how to use 2 displays together for display of time and date. and maybe some how later auto time update like GPS or GSM? i been wanting to do this for years..
As you probably know, your HDSP-2531 is pin-to-pin compatible with HDSP-2534, just a different color. To use 2 display, you probably should multiplex them through CE (chip select). The WiFiChron code already supports GPS. Let me know if you are interested in a WiFiChron kit without the display. will your kit support 2 displays with modification ? can you advise on connections ? as far ad CE i am not very familiar with multi-displays. is there the possibility of some form of GSM communication for time setting ? i work in a metal building and i do not think GPS would work indoors. Yes, it is possible to connect 2 displays to WiFiChron, with some modifications, the first one being be the display board (which needs to be re-designed, unless you want to wire it manually). Then it's the software, which needs to be adapted for 2 displays. This is an interesting challenge, I would give it a try. For accurate time setting, WiFiChron already supports NTP through WiFi. So, it connects to the WiFi network, then accesses an NTP server to get the current time. What kind of info would you show on the double display? I should also add that the Serpac A21 box can accommodate 2 displays placed vertically. ( 2 displays to one socket) might be possible. i just need to make sure of the connections. but yeah,,if your kit will work i will buy it to start with. i am excited to be able to finally use these displays that i have had for years..
An adapter for the double display can be easily made from prototype board and hand wired. i forgot to ask the cost of the kit with out displays, and where do i purchase. The kit without the display will be $30, shipping included. It comes with a PCB adapter for the single display. That's not removable, so once soldered, it cannot be taken out. But, if you want to make your own enclosure (and not use the Serpac A20/21 box), then you could build a second adapter (for the double display) that plugs in the fixed single adapter. Just an idea. Oh, forgot to mention, you can paypal me directly, florin at cifo dotcom. sounds great, and yes i'll probably use my own display box. i am glad i found your site..
Question,, if i buy the kit and need any help can i call apon you ? i have excellent solidering skills etc, only thing i'd probably need help with is maybe the code for the 2 displays. but yes i really want the kit. i'll respond as soon as i see your reply..
or to cut out email tag you can call me if you like 910-308-7343 thanks..
and then we go from there later. i got your kit in today. i have soldiered some really small stuff in my days, but this SMT will be a challenge. got any tips to solider on the mini USB connector ? the other 2 SMT chips will not be a problem. i forgot to ask,.. where can i find the WiFi module that will be needed ? the IC ( 74AHC125 )what is the pin 1 orientation? i do not see it being used in the schematic, but it is in the kit and the location is on the board. will be mounted under the Wifi module. i think i found out which Wifi module is needed. is this it ? ESP8266 Serial WIFI Wireless Transceiver ? as you can tell i could not wait to start assembling the kit..lol i got the USB connector on ok. :o) was as hard as i had thought. The IC key is towards the bottom of the board (it is shown in the silkscreen, if you look closely). The WiFi module I used is indeed ESP8266. hi again, i finally got the kit finished tonight, it is working great except i cannot find out how to get the wifi to connect, i thought i saw a link somewhere explaining it, but i can't find it, can you point it out to me? great kit, but not for the beginner. the SMT was a bit challenging, especially the mini USB jack. but i got it all correct. ok, i have saw that, but how do i connect to this? do i use a FTDI ? or am i supposed to connect to the wifichron ? if so how ? i have tried to use a FTDI and Arduino's Tx and Rx pins,and a 10K connected to the CH_PD and vcc and i am using a serial program called Termite. i got things all connected correctly, and when i try to communicate, the Tx and Rx leds show comm, but all i get on the serial monitor is garbage, have tried several baud rates. i am at a loss, i have 2 of the ESP8266 modules, so i doubt they are both defective. other than the the clock works, just can't get ESP8266 to communicate. UPDATE >> Grrr lousy laptop, it crashed, and i think it spiked my wifi modules, i had 2 of them, i am replacing the FTDI also,,i decided to buy a Wee module as shown in one of your links. so i am going to wait for the new stuff to come in and then i hope i have luck then. but i am learning a lot as well..
hi there.. got new parts in, trying it again..
in this link --- >>> http://benlo.com/esp8266/esp8266QuickStart.html it show how to flash the ESP 8266 and how to program it. well i downloaded the programs to do the job.. i successfully flashed the ESP8266 or at least it says it was successful. i used the program, "ESP8266flasher"
i connect and all i get is garbage. i have changed baud rate. i even ordered the xbee wifi module, it is not in yet. but i am hoping to get this ESP8266 working 1st. UPDATE >>> i been on this forum getting help as best as they can help me, it is a forum dedicated to the ESP8266 module. my last post i think is success. only thing i do not know is,, how often does the clock update? how many times a day ? (page9 in the link and see if everything looks ok that i have done. i do want to build more clocks, and may have a friend that wants one also. The current code queries the SNTP server every 12 hours (line 320 of esp8266.cpp). The time from RTC is queried many times every second (in the main loop()). I read your post in the forum. Great job! I am a bit behind with this stuff (busy with my job currently), so it will take me some time to catch up with what you do. Also, you can enable the display of the debug info by commenting out the #defines at the top of ESP8266.cpp. The commands and info will be shown on the LED display. "Also, you can enable the display of the debug info by commenting out the #defines at the top of ESP8266.cpp. The commands and info will be shown on the LED display."......... this part i do not know how to do..can you explain ? the clock has been running, but no time update. so something is not quite right.. i hate to ask this, but do you think i could call you sometime and we try to figure this out over the phone ? i am interested in ordering more kits in the future. We can talk, sure, but I may not be that quick with an answer over the phone. The question is: can you compile and upload the code? If no, we need to start from there (compiling etc.) If yes, you need to un-comment (delete the double slashes) from the first 3 lines that have #define in the file ESP8266.cpp. Then re-compile and upload. i have no idea of compiling or coding.. i am surprised i was able to do as much as i have so far. i am going to later check and see if the wifi module is connecting to the modem.. right now the blue light just blinks once or so every few seconds. i just have no clue why it is not getting the time yet. whats with the SNTP link ? will this just show the local temp? or what else ? The SNTP link is the address of the NTP server. Lines 871-900 of the ESP8266.cpp connect and query the NTP server for the current time. There are many NTP servers, one of them being pool.ntp.org, which you probably have configured. i think i may have found my issue..
when i enter my SSID ex. ( MY WIFI )the SSID shows up as "MY+WIFI" i cannot enter it without the "+" auto filling in. how do i enter the info without it automatically filling in the +'s ? Florian.. i tried something new today. i brought the clock to work and tried to connect to the wifi here.. it seems to have finally connected. and after it shows the date there is a "up arrow" i do not know what it means but i assume it means i am connected to the router now ? the clock has not updated yet, but i'll let it go over night and see what it does the next day.. hopefully i see the correct time and date.. BTW the router shows the IP i mentioned, so that is a plus..
please advise what can be done about the +'s in the SSID resolve is.. and what is the meaning of the "up arrow" after the date.. thanks..
set up page exactly as you have shown.. is that what i am to do or what ? but i still am unsure of the password issue of the clock entering +'s in place of the spaced in my SSID..
i put underscores in place of the spaces "_"
i then connected to my network.. and i then connected thru serial and i get this information. Why don't you use the user defined font? my wifichron is working fine. Must be an old comment that somehow just got activated. strange...lol i just now noticed the date..
how have you been ? have you been in touch with mike in a while ? he has been doing some new code with the Wifi Chron. Yes, Mike sent a few new software updates, I can hardly keep up. yes, he is always up to something. he is working on a new clock now..
i am in Fayetteville and he is in Durham.. we have yet to meet.. but possible next month..
i just got back from europe earlier this month..
How much does it drift between GPS updates? I did not check. But probably not more than 1 second, since the DS3231 is rated at 2ppm (1 second every 5 days). The GPS sync can be done even once an hour for a drifty RTC. IMO, you will never notice a drift in time what so ever..
Hi, I have a QDSP-2084 display and I can't find the datasheet, where can I find it?. Hi, where can I find the datasheet of QDSP-2084 display? I tried to google it for you, with no (immediate) success. From the looks, I bet it is the same as HDSP-2111. Please update me if you find otherwise.